North America's longest running anime magazine, Protoculture Addicts, gets a major face lift courtesy of Anime News Network. Anime News Network (www.animenewsnetwork.com) sent out a press release shortly before the convention, letting it be known that they would be making a rather large announcement at Nan Desu Kan 8. Speculation abounded among Animefringe members. Was it a magazine as the polls on their site seemed to hint? Would ANN be releasing a print version of their site? If so, would it be able to survive in the fickle publishing market? Did they have advertisers? Armed with these questions, I went in to learn just what exactly the big news was. We were close, but no cigar. 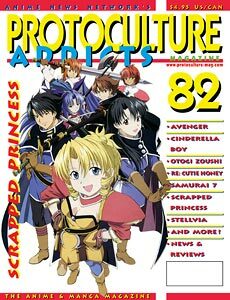 Anime News Network announced their acquisition of long-time indie anime and manga magazine Protoculture Addicts (http://www.protoculture-mag.com or http://www.protoculture.ca), which will begin publishing January as Anime News Network's Protoculture Addicts. Christopher Macdonald (owner and editor-in-chief of Anime News Network) made it clear that Protoculture Addicts will be a companion to the website, and in no way a replacement. There will be some overlap (such as lists of new releases), but they will be mostly independent, with different yet complementary articles. One of the reasons that ANN picked up Addicts was compatibility in attitude and style, a focus on substance over pretty glossy pages and advertisement dollars. Another was purely the opportunity to ensure that Addicts could continue on for another fifteen-odd years and be there for the next generation of otaku. The magazine will be remaining pretty much the same for now. Claude Pelletier will remain at the helm, and the current contributing writers will remain the same, but expect some of the writers over at ANN to be showing up occasionally in Protoculture Addicts. None of ANN's contributing writers have exclusivity agreements (i.e. they are freelance writers), thus you can find their work spread throughout diverse publications, on the web and in print. Two full-time reviewers have been hired to bolster Addicts' coverage, but that's about all. Chris wants to increase the page count at a ratio of one page of ads to four pages of content, but obviously, that is going to take some time. The content of Addicts will be evaluated and edited once the semi-renamed magazine is a few more issues in. The features that the readers do not like will be eliminated to make room for the popular ones. It goes without saying that Addicts will have a lot more industry news within its covers. ANN's free news-feed is used by several popular industry magazines, so it is quite possible that some of the news may seem familiar. Needless to say, Addicts will have the latest and juiciest tidbits. We were given past issues of Protoculture Addicts to look through at the announcement. It's definitely no NewType. The layout is 72 pages of content to 7 pages of advertisement, a ratio, which frankly, we don't see anymore due to costs. The font is smaller, allowing for more content per page. The paper of the pages is thin, somewhere between notebook paper and newspaper, giving the magazine an underground feel to it. All pages (save 8) are black and white, the only glossy paper found on the cover. Subjects include: anime reviews, events of interest (festivals, conventions), anime-related products (manga, CDs, toys) and Japanese culture (live action movies, music). Protoculture Addicts is not meant for the Yu-Gi-Oh crowd; articles and reviews are aimed for an adult audience. Sorta like Animefringe actually, which is why I think you, the 'Fringe reader, should try Addicts out. In the future, Addicts wants to produce more anime guidebooks, with up-to-date information and including the latest shows, something that the community is in dire need of. Sure, we have websites that currently act as guides, but nothing official and nothing for the people who are not connected 24/7. Make sure to ask your local store to start ordering in the magazine for you, but first check to make sure that you're not lucky and your store already carries Protoculture Addicts. It's only $4.95 per issue, well within -- and worth -- the budget of high school and college-aged fans. Eventually, the goal is to take Protoculture Addicts into the bookstores so even the casual manga purchaser can learn about what's new, what's good, and what's coming soon from Japan. Promotion of the magazine is limited to Anime News Network's website, convention panels, and word of mouth. So, spread the word and support a magazine made by otaku for otaku!